Israel's Likud party has started a series of meetings to discuss choosing a new leader, after Ariel Sharon left the party to form a new political bloc. At least seven members are competing to lead the right-wing party in elections expected next March. But opinion polls suggest the party is facing the loss of more than half its seats in parliament. Chief Palestinian negotiator Saeb Erekat said he hoped any new government would want to continue negotiations. "I hope that when the dust settles, we will have a partner in Israel to go toward... a final arrangement," he said. UN Secretary General Kofi Annan warned that there may have to be a pause in negotiations in the run-up to elections in Israel and the Palestinian Territories, where legislative elections will be held in January. "I hope that these elections will go smoothly and we can get back to pressing the parties in the peace process," he said. Mr Sharon's supporters say he wants to draw Israel's borders in the framework of the international peace deal known as the roadmap, and he has ruled out further unilateral pullbacks from occupied Palestinian land. "The process clearly is a process that leads in the direction of two states," said Justice Minister Tzipi Livni on Army Radio. Mr Sharon announced he was forming the National Responsibility party on Monday. He took 14 Likud MPs with him, enough to ensure he could claim part of his old party's government funding. 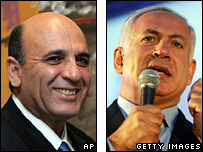 But he has failed to woo Defence Minister Shaul Mofaz, who joins at least six others hoping to succeed him. Former Prime Minister Benjamin Netanyahu, who is favourite to succeed Mr Sharon, congratulated Mr Mofaz and told him he had made "a responsible and intelligent move". Other candidates include Foreign Minister Silvan Shalom, Agriculture Minister Yisrael Katz, Education Minister Limor Livnat, Moshe Feiglin, and Uzi Landau. The head of Likud's central committee, Tzahi Hanegbi, has become the party's interim leader. He's expected announce a date for leadership primaries on Thursday, Israeli press reports say. The reports suggest the primaries will be set for the middle or end of December. Senior Likud figures have downplayed Monday's events, but polls by three Israeli newspapers suggest that Mr Sharon's party would win the largest number of seats in parliament. Surveys conducted by Yedioth Ahronoth, Haaretz and Maariv found that the National Responsibility party would gain between 30 and 33 seats in the 120-seat Knesset. Likud would win between 12 and 15 seats, a substantial decrease in its current total of 40. Labour would secure 26 seats, eight more than it secured in the February 2003 election.